Liberation Tigers moved into the entire areas south west of Batticaloa town Monday. Several military units of the LTTE, which moved from different directions, took control of Kokkadichcholai around Monday noon. Karuna Group's propaganda organ, Tamil Alai office and the Press were taken over by members of the LTTE's political division who also moved into the area. Meanwhile hundreds of male and female cadres from Renegade LTTE Commander Karuna's main base, Meenakam, began arriving in their villages from Monday morning. One group that left the Meenakam camp told TamilNet's Batticaloa correspondent that their unit commander had advised them to either go home or join the LTTE units that were moving into various parts of the Batticaloa district. The commander of an LTTE unit in Batticaloa said he visited Thenakam Conference Centre in Karadiyanaru last evening and that the place has been abandoned. 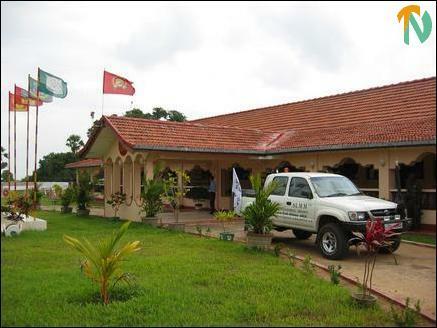 Thenakam Conference Centre was renegade commander Karuna's main political and public relations headquarters for the Batticaloa Ampara district. A spokesman for the LTTE units that arrived in Kokkadicholai region said their troops are expected to take over the Karadiyanaru including Thenakam by Monday evening. He said there was no resistance and that a large number of unit commanders of the Karuna Group have made contact with them and are expected to come over with their cadres in the following days. The political officers of the Karuna Group in the main towns and villages along the Batticaloa coast were abandoned since Saturday.